We present an interactive system that lets a user move and deform a two-dimensional shape without manually establishing a skeleton or freeform deformation (FFD) domain beforehand. The shape is represented by a triangle mesh and the user moves several vertices of the mesh as constrained handles. The system then computes the positions of the remaining free vertices by minimizing the distortion of each triangle. While physically based simulation or iterative refinement can also be used for this purpose, they tend to be slow. We present a two-step closed-form algorithm that achieves real-time interaction. The first step finds an appropriate rotation for each triangle and the second step adjusts its scale. The key idea is to use quadratic error metrics so that each minimization problem becomes a system of linear equations. After solving the simultaneous equations at the beginning of interaction, we can quickly find the positions of free vertices during interactive manipulation. Our approach successfully conveys a sense of rigidity of the shape, which is difficult in space-warp approaches. 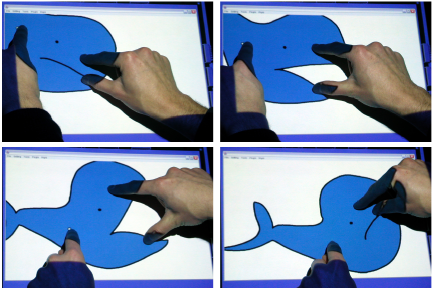 With a multiple-point input device, even beginners can easily move, rotate, and deform shapes at will.